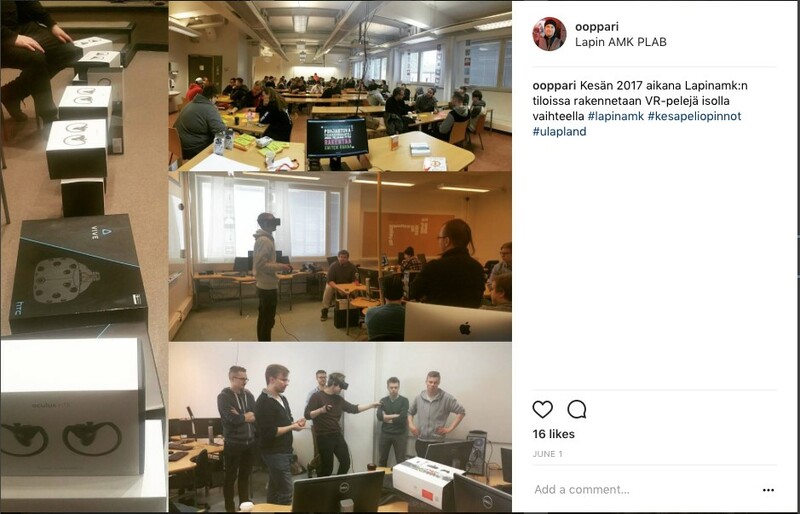 During the summer of 2017, Lapland University of applied science and Lapland University Faculty of arts organised a summer game studies course and training. 60 participants created games in a virtual reality environment. Virtual reality was selected because of its challenges and, of course, because of virtual reality’s huge potential. Virtual reality is a highly hyped technology in games. We had participants mainly from both organising schools. That provided a nice combination of art and programming knowledge to the teams. Art and code actually defined our workshop topics. We had topics about programming (Unreal Engine, Blueprint, C++) and topics about art (Concept, 3D art, animation, audio). All of the game projects used Unreal Engine 4 as the heart of the game mechanics. Unreal Engine was not a familiar engine for students before. In that form, all the participants were at the same level and studies started by taking a look at how things are done in UE4. Unreal Engine programming is done using Blueprints. Blueprint is a graphical programming language which is really easy to learn. That way, programmers and artists were immediately able to start implementing their ideas in functional game mechanics. For low level implementations, UE4 uses C++. Basically, a programming team should implement gameplay mechanics using Blueprints and those parts which make gameplay mechanics possible using C++. Originally, VR game studies were thought to have only 15-20 students. We started to advertise the course at a really late phase. Still, we had nearly 60 participants. That raised a problem regarding the environment where the work could be done. Are there enough GOOD computers and tools for teams? Luckily, we have had several public projects which had bought several highly efficient game computers. When creating VR-games, you need to have at least an NVidia 1070 or better graphics card. A good graphics card is also beneficial for game development so that the computer does not have to struggle when creating game scenes in Unreal Engine. 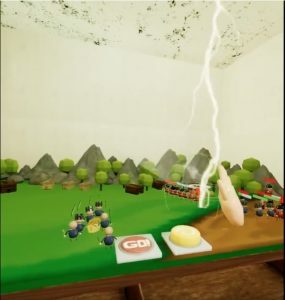 When making games using Unreal Engine and VR, it is a difficult task for the card. We managed to burn 9 graphics cards during the summer. All of the lectures were organised as workshops. Each lecture that the participants joined contained some theory, but mostly workshops concentrated on pushing game projects forward. 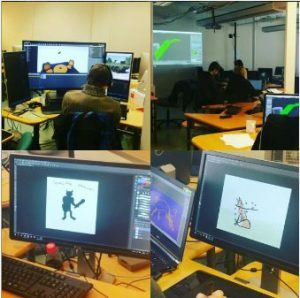 Workshop topics contained game design, game programming (using Unreal Engine, blueprint, C++), 3D art, 2D concept art, business, Unreal Engine basics, history of games and game audio. We provided knowledge about all the game development main areas. We have a programming laboratory where we have a specialist in all those areas. Teaching and lecturing was organised mostly using part-time lecturers. The results from the summer were quite amazing. Here is some statistics about the summer. During the summer, the students were able to earn 20 credits per student (some students only completed the theory part, 10 credits). The students completed a total of 910 credits. We had 12 teams. The teams created 10 VR-games and 2 “traditional” games. The teams had in use 6 Oculus Rift and 4 HTC Vive VR-device sets. We had 15 drawing tables, 25 Predator computers, 24 iMacs and teams were in 3 classrooms (and a huge amount of “office”-level computers). Unreal Engine was a tool that everyone used in the game studies. It combined all the work together. The students also used Blender to create 3D art. Substance Painter 2 was used to create textures for 3D models. Git is a version control system, which makes project file organising and backup a little bit easier than USB sticks. In the best practices part, I really would like to recommend the use of Slack. It made the communication of the team’s direction really easy. It doesn’t have similar latencies as e-mail and when everyone is already on the same channel you don’t accidentally forget someone. All the discussions are easy to find later on. The usual use case was that team X would have some problem (in unreal, programming, 3D art…). When the teacher answered that question in Slack, later on anyone could find that same answer when facing the same problem. Via Slack, we could easily share scheduling changes and all the information related to studies. Slack is keeping and providing statistics of its usage. Considering that this was a pilot, the feedback has been really excellent. We are now have a really good foundation to build on for next summer’s game studies in Lapland. The ArcticShell-public project is ESR-funded. 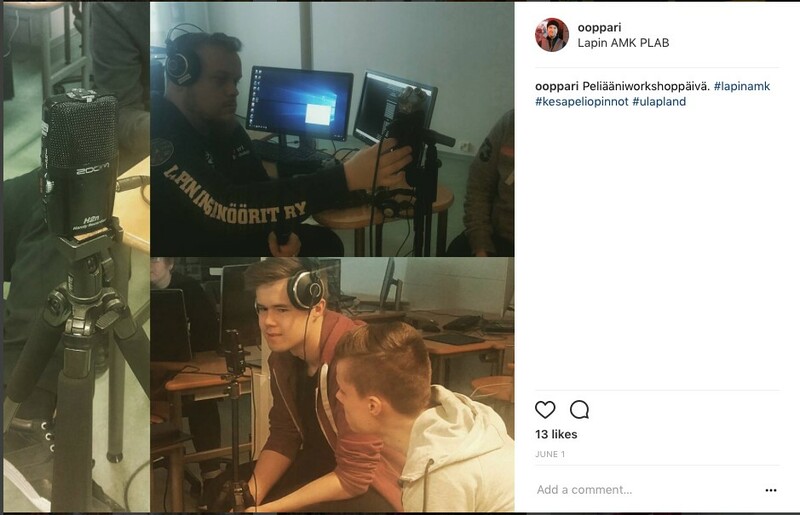 The ArcticShell purpose is to increase co-operation between Lapland UAS and Lapland University faculty of arts in game development education. The ArcticShell project made it possible to arrange a pilot project. Without the ArcticShell planning resource and connection for such a big push as summer game studies, organising it all wouldn’t have been possible. Summer game studies were a good experience for the students.